I have been some time an undecorated SW1200 of MTB and have wondered what I can do with it! Then I found these pictures-perfect for my Canada layout! On the last picture you have the perfect comparison! I have the undecorated kit of MTB, which I will take. The prototype is obviously the illegitimate love-child of an illicit liaison between a GP9 and the SW1200...!!!! Dynamic brake split or not? if you plan to sell the truck side frames also separately, I'm interested too. And what about alternative number boards for a correct CN SW1200RS version? Last edited by Zs12 on Sun Apr 15, 2018 3:31 pm, edited 1 time in total. The number boards are the next step and the numbers as decals the last! 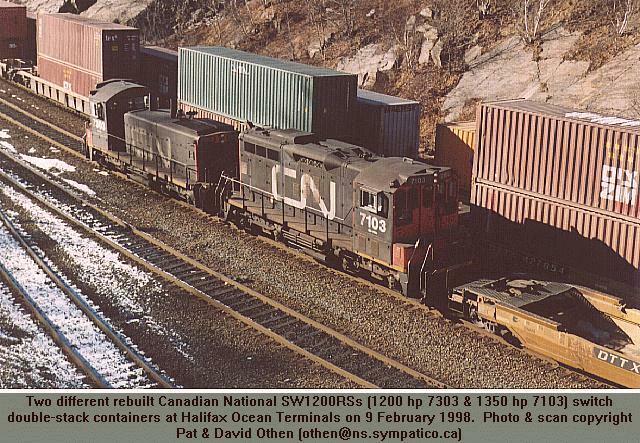 A SW1200RS, as of rapidotrains I have still in my head! ART&DETAIL wrote: Who can help? perfect, thanks for the picture! Great, then it goes to the number boards. Does one have a good drawing, or a picture from the front?